Different argon inserts for preventing the molten steel from re-oxidizing. 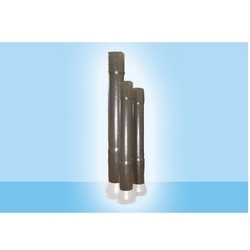 The canopy nozzle can prevent the steel from flowing upstream when start casting. Long service life and non-preheating ladle shroud: compound material for different steel grades and make the service life over 450 minutes. - Design & size as per customer's requirement. - Slag zone immersed part re-enforcement with special material for long life. - Argon sealing purging arrangement can be provided on customer's request. 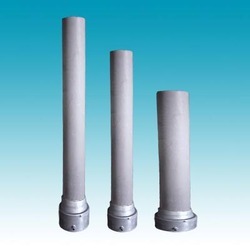 The VESUVIUS Ladle Shroud is a ceramic tube manufactured from isostatically pressed alumina graphite custom designed for immediate connection to the Ladle Slide Gate Nozzle giving maximum protection of the steel stream against oxidation from the atmosphere and minimizing steel splashing. We are engaged in offering Ladle Shroud.